Amy Lea ‘n Me does not carry plants for your Fairy Garden. We are great gardeners ourselves but will leave the care and tending of plants to the nursery professionals. We highly recommend that you visit your local nursery first to find miniature plants. They will often carry plants that are popular and in demand for your area. They can give you good advice on planting and caring for your new plants. Amy Lea ‘n Me is located in Minnesota so to be winter hardy we need plants that are hardy in zone 3. However, it is also fun to have annual plants that bloom throughout the season.Knowing what is hardy in your area (zone), how much sun or shade is needed, as well as watering needs are the same whether the plant is 3” tall or 3’ tall. Be sure to take into consideration not only the size of the plant when you purchase it but also how big it will get when mature. Also look at the texture and color of the plants as you put them together. Just as in a human garden, a good variety of leaf shapes and colors make for a more pleasing garden. Color is always a bonus in any garden. Another idea to consider is the use of non-real plants. If you are just beginning your journey into the land of fairy gardening you may not want to spend money on live plants until you know how you want your garden laid out. But, you do want that look of greenery and growing things. 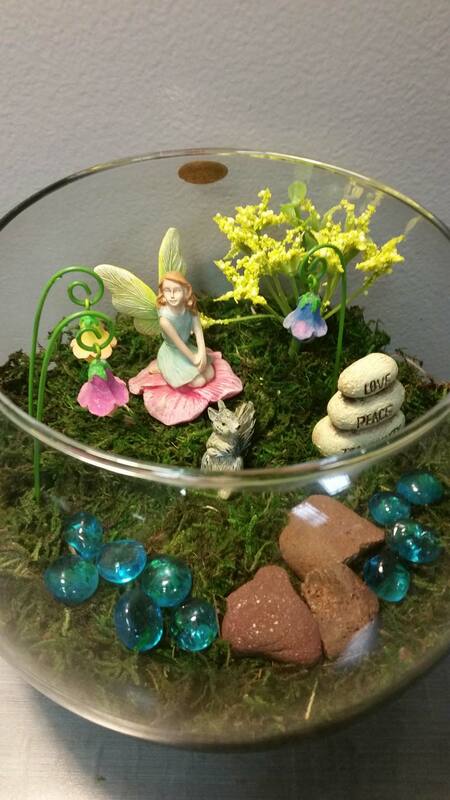 Silk and/or plastic is an option as you begin to visualize how your fairy garden will look. You won’t have to worry about the amount of sun they get or watering them! You just may decide they look so good you will keep them. Truthfully,I use some silk flowers in my fairy gardens for color, but don’t tell anyone. Well, that is the extent of my wisdom for now. Happy fairy gardening!